Dr. Leah Goldin, whose MIA son is in Hamas's hands, says UN's emissary wants to "upgrade" Gaza without bringing back MIAs. 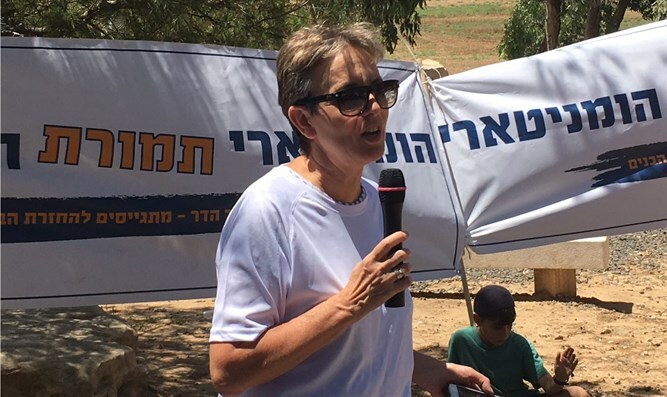 Dr. Leah Goldin, whose son, Lt. Hadar Goldin, is MIA and presumed dead since 2014, attacked on Friday the UN Middle East emissary, Nickolay Mladenov, accusing him of seeking to "upgrade" Gaza without bringing back the remains of Israeli MIAs held by Hamas. She spoke in the weekly event near the Gaza border that has been held for seven weeks running, with the aim of bringing home Israel's MIAs from the 2014 Gaza war – Lt. Goldin and First Sgt. Oron Shaul – both presumed dead, as well as several Israeli citizens who crossed the border due to health issues are being held. Mledanov, said Goldin, has been working against her family since he entered his current position. "In the last few days, we have understood that Mledanov is advancing a move to give Gaza assistance and to upgrade it, without the solution of first bringing back the IDF soldiers and Israeli citizens." "I fail to grasp where he gets the chutzpah – as a UN representative – to advance such a move," she protested. "How does he allow himself to operate against international humanitarian law? Hadar was abducted during a ceasefire that the UN had initiated, and Mledanov – as the representative of the organization in the region – is responsible for Hadar's fate. But, instead of taking care of Hadar, Mledanov evades responsibility and operates against us. Since he entered office in 2015, I have yet to see him try to create a solution that would bring Hadar home, even once". Also attending the event today were Jewish Home Knesset faction chair MK Shuli Moalem Rafaeli, Keren Kayemet Chairman Danny Atar, former Southern Command Head Dr. Yom Tov Samia, Eshkol Regional Council Head Gadi Yarkoni and members of the Goldin family. The weekly events demanding the MIAs are a counterbalance to the weekly riots on the Gaza side of the border fence, which began on March 29.